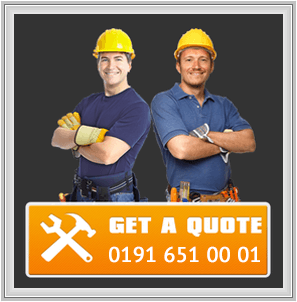 Handyman Newcastle, an insight into how we price. Here at Handyman Newcastle we want to be totally transparent in how we charge. WE CHARGE ÃÂ£40 FOR THE FIRST HOUR, AND ÃÂ£15.00 FOR EVERY HALF HOUR THEREAFTER. Please see below for more detail. We love small jobs, that is how we started and we will continue to do all the small jobs that, other trade companies don't want. The reason other trade companies dont want the smaller jobs is, the way they normally price, that is , how long does it take to get to the job, what about wear and tear on the tools and van, what about wages and profit, and all you asked them to do was change a hinge if its a Joiner, or fix a switch, if its an electrician, and what happens if you need both done and a washer changed on a Tap to, altogether how much would the 3 of them charge you if you put them all together, you would need to take out a second mortgage, and we could probably do all 3 in 1 hour, so as you can see, they are simply, not set up as we are ! As I said we love small jobs and have therefore come up with what we believe is an ideal pricing structure which is easy to understand and covers all that we are asked to do. We charge ÃÂ£40 for the first hour and ÃÂ£15.00 per half hour thereafter, Monday-Friday, no matter what you ask us to do, we may change a switch, fix a leaky tap and put out the rubbish all within 1 hour, therefore you pay a 1 hour charge only ! get the idea ?, or after that, if it takes us longer then we charge in half hour increases. By being charged half-hourly you have piece of mind that you are not paying for an inflated estimate that you may be charged from other trade companies. After 5 pm and . Weekends are an extra 25%. Also it is important to understand that if a job requires 2 Men then the rate doubles, however in most cases the job is done in half the time, so really it is the same, this however should be taken into account when you plan. We really do want to be as open as possible and up front about our pricing, so here are a few examples. We charge ÃÂ£50 for a written estimate, however if we actually do the work then the ÃÂ£50 is deducted from the cost of the total price. Mrs x. has 2 very large wardrobes that need to be moved upstairs in her house, each wardrobe is to much weight for 1 man to carry up or down stairs, so we sent 2 men, the job only took 1 hour but Mrs x. was charged 2 hours as there were 2 handymen there for that period of time . However this hourly rate only applies to the smaller jobs, the ones that last from 1 hour to 1 day. If you have a larger job then of course we agree a price , then no matter how many men attend the job, the only price you pay is what we agree before we start, see example below. WHEN WE ARE ASKED TO DO THE LARGER JOBS, WE OFFER A FIXED PRICE ! Mrs y, asked us to rip out her old Kitchen and supply and fit a new one, she also asked us to rip out all her windows and replace them with UPVC double glazing, but she asked for a price as opposed to an hourly rate, there were 12 men in total on that job, we were there for a number of days but the lady only paid the price we agreed, as it was on a price and that was that. So to recap, Here at Handyman Newcastle you have the best of both worlds, we can do a number of small jobs on an hourly rate or the larger ones on a price, you choose what pricing structure you want EASY ! Our Handyman is used to all the small jobs that needs to be done, typical examples of the jobs we are asked to do, are, assemble Flat Pack Furniture, or repair Fencing and Decking, maybe replace a damaged Brick, we are often asked to put up a Curtain pole, repair leaky Taps install a new light switch touch up Paint, here and there, or Mow the Lawn.